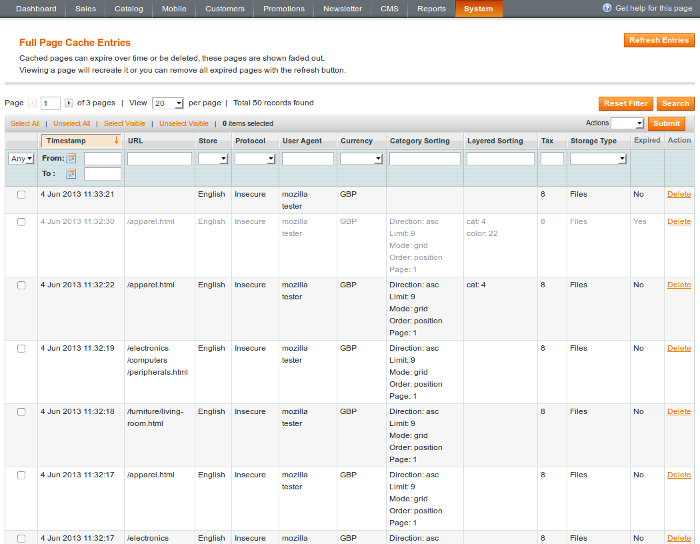 The release of Evolved Caching 1.3.0 marks another major update to the Magento extension. While version 1.2.0 added important features which allowed for a truly effective caching strategy, version 1.3.0 takes management of the full page cache to a new level. So no more flying blind with your Magento full page caching, this update gives you confidence and complete control over your stores full page caching. As well as adding this high level of caching control, Evolved Caching 1.3.0 also adds another highly useful feature - automatic cache clearing. This optionally allows you to clear relevant full page cache content when saving product, category and cms pages in admin. Only the relevant cache content will be cleared, so for instance when saving a category or cms page, just the cache for that category or cms page will be cleared leaving all other full page cache intact. When saving a product page, automatic cache clearing will clear full page cache content for every instance of that product page (for instance if you can access the product the from different categories resulting in different URL's for the same product). 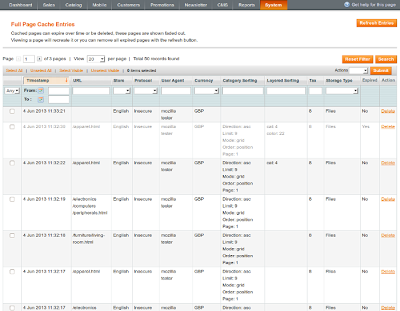 It will also clear the cache for any categories that product is assigned to. In addition to this, you can also choose to automatically clear the standard block HTML cache type when saving product, category and cms pages, so no more invalidated cache warnings as soon as you hit the save button. The inclusion of automatic cache clearing gives you the freedom to just get on and work with your store without having to continually clear the cache to make your changes visible on the frontend.